Participating bar teams are to create a unique recipe and creative theatrical concept using one or more products from the complete Lucas Bols Global Portfolio (Bols Genever, Bols Liqueurs, Bols Vodka, Damrak Gin, Galliano, Passoa, and Vaccari), to allow for maximum inspiration.Teams will post a video of their bar team bringing their concept and recipe to life on their social media channels. “With our Bols Around the World 2019 competition, we intend to challenge and inspire every cocktail professional around the world.We are excited to give this 10th edition a twist by tapping into the creative energy of bar teams.At Lucas Bols, we strongly believe in the power of team spirit, and we look forward to the inspiration BATW 2019 will bring to the bartending community,” says Huub Van Doorne, CEO Lucas Bols. The six finalist bar teams from North America, Eastern/Central Europe, Western Europe, Asia Pacific, South/Central America, and Africa/Middle East, will be flown to Amsterdam to compete in the Grand Finale on Wednesday 19th June 2019. 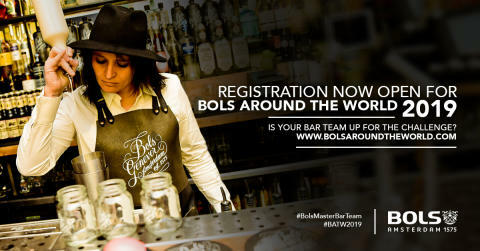 Over two thousand bartenders entered the 2017 BATW competition from 75 different countries.Jessica Mili from Toronto, Canada was crowned Bols Around the World Champion 2017 and Bols Genever Pioneer following a sold out finale event on Bols Geneverstreet in the heart of Amsterdam. Lucas Bols is the world’s oldest distilled spirits brand and one of the oldest Dutch companies still in business. Building on its more than 440 year-old heritage dating back to 1575, the company has mastered the art of distilling, mixing and blending liqueurs, genever, gin and vodka. Lucas Bols owns a portfolio of more than 20 premium and super premium brands of different spirits used in cocktail bars worldwide. Its products are sold in more than 110 countries around the world. Scotch whisky distiller Edrington handles the distribution in Nordic countries.